Bundled by B&H for your convenience, the Yamaha TRBX504 Electric Bass Starter Kit provides everything you'd need to get started playing the electric bass in an amplified and stylish manner. 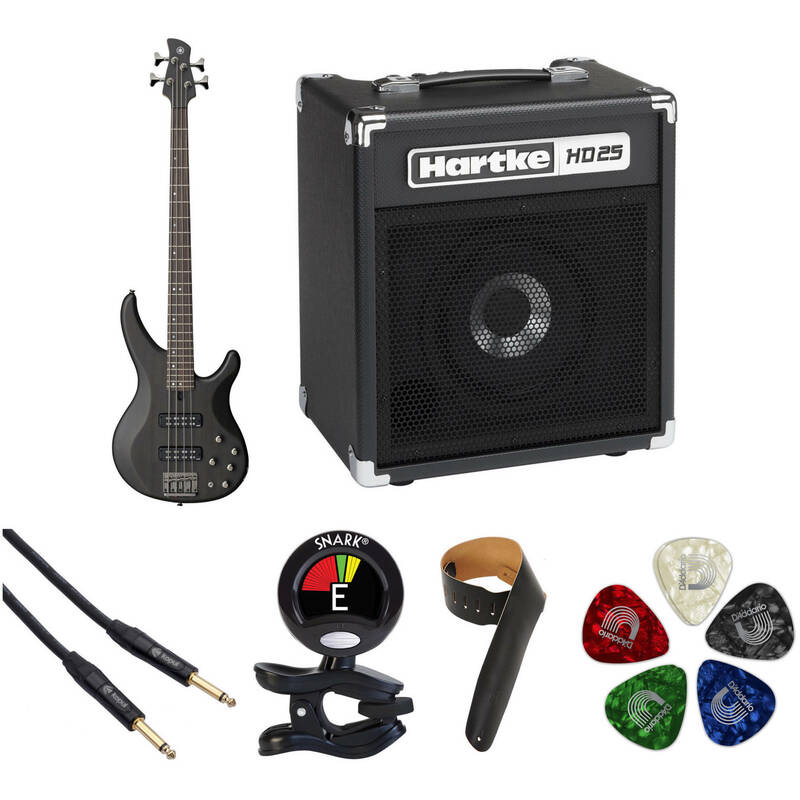 The kit comprises a Hartke HD25 25W 1x8" combo amplifier, a strap, a clip-on tuner, an assortment of picks (should your fingers tire, or should you want more attack), and—let's not forget—a handsome electric bass in the TRBX504, which is styled in a translucent black finish. Additionally, an instrument cable has been provided for connecting your instrument to the amplifier, ensuring that in its totality, this kit will provide a solid baseline for all of your bass lines. Allowing you to select between an active or passive preamp for a wide variety of available tones, the translucent black TRBX504 4-String Electric Bass from Yamaha features a solid mahogany body with a 5-piece maple and mahogany neck with rosewood fingerboard. Its dual alnico pickups were tuned to match the selectable preamp, and there are treble, middle, and bass controls to further dial in your tone. Its controls are rounded out by its active/passive switch, a pickup blend knob, and a master volume knob. Box Dimensions (LxWxH) 42.0 x 18.0 x 4.0"